Butanol. 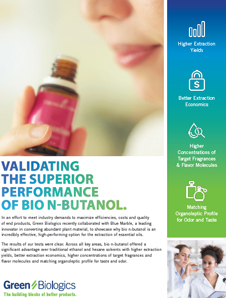 Green Biologics nC4-OL (Renewable n-Butanol) is 100 % renewable n-butanol produced through fermentation of agriculturally derived sugars by Green Biologics’ proprietary Clostridium microbial biocatalysts. It is selectively produced by bacteria, and not by processing petroleum distillates. Used for the manufacturing of esters utilized for fragrance and skin care in personal care goods. Cosmetic products that utilize Green Biologics nC4-OL (Renewable n-Butanol) in their formulations include eye makeup, foundations, lipsticks, nail care products, personal hygiene products, shaving creams, and moisturizers. It is a four-carbon alcohol that is a clear, colorless, flammable and neutral liquid with a characteristic banana-like odor. The medium volatility and restricted miscibility in water of n-butanol make it useful as a solvent. It is a valuable feedstock for the production of higher value chemicals, chiefly ethers and esters. Please note, these HSP values are estimations. It is based upon the “like seeks like” principle. It splits an ingredients interactions into three parameters; δD (Dispersion force interactions), δP (Polar forces interactions) and δH (Hydrogen bond force interactions). Hansen Solubility Parameters can help you find a wide range of products that are predicted to be compatible with Green Biologics nC4-OL (Renewable n-Butanol). A practical determination of these HSP values would provide higher certainty. Learn More.